Eminue was with the Georgia Army National Guard. He was deployed to Afghanistan three times, according to his family. 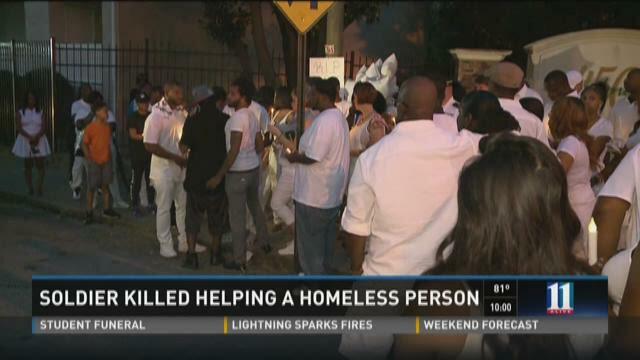 At the vigil held outside the Peachtree Pine homeless shelter where he was killed, Eminue was remembered as a soldier, a son, a father and a man who died trying to help someone in need. "He was just giving someone out here his shoes because they didn't have any shoes on their feet," said Tyquan Walker, Eminue's best friend. "And they were brand new sneakers." Police said another man started arguing with Sgt. Eminue about whether the shoes were fake and shot him multiple times. Many of his friends who were at the vigil were with him that night. "I lost my brother and a big part of everybody here," Walker said. Eminue's older brother said his family moved to America fifteen years ago from Nigeria. "I've seen this man grow up from back in Nigeria," Eminue Eminue said. "And now he's killed in America, the country he went to war for." Eminue said his brother has a four-year-old son, Emory. "I know his birthday is coming up on October Sixth," he said. "How can I explain to his son your daddy's not going to be here for your birthday?" No arrests have been made in the murder case. Atlanta Police are asking anyone with information to call Crime Stoppers Atlanta at 404-577-TIPS (8477).